Can Justify complete the American Triple Crown? May 16, 2018 5:06 pm. 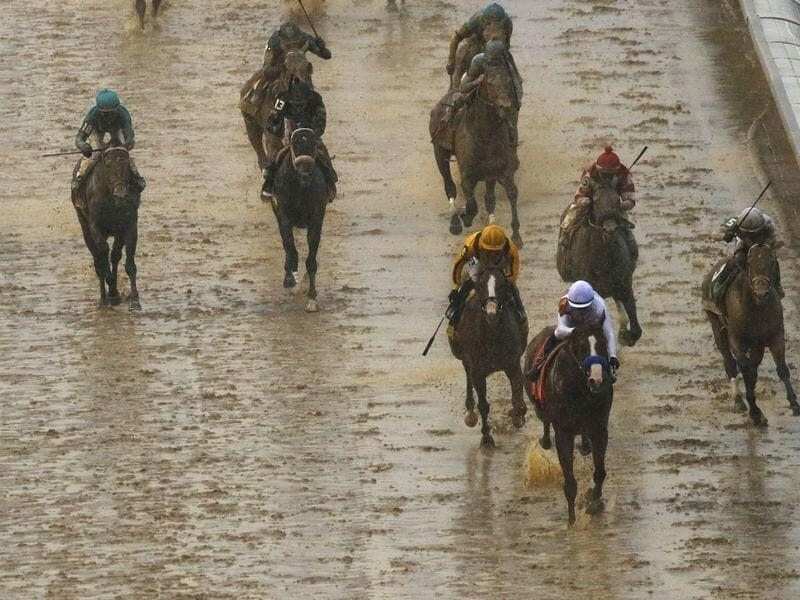 Justify wins a rain-soaked Kentucky Derby at Churchill Downs. THE inevitable question following the Kentucky Derby every year is whether or not the winner of the race can go on to complete America’s Triple Crown. Following a brilliant display in the headline race on the American racing landscape, many are predicting that the Bob Baffert three-year-old can go on to complete the elusive hat-trick of wins. Many horses have looked likely in recent years, but only one horse since Affirmed did it in 1978 – American Pharoah in 2015 – has gone on to win the Preakness Stakes and Belmont Stakes following a Kentucky Derby success. Online bookmaker Ladbrokes has Justify as a $3 chance to become the 13th horse in history to complete the American Triple Crown, but is the horse a realistic chance? After pulling away in a Kentucky Derby slop-fest, there were serious questions about Justify’s ability to back up in the Preakness Stakes this weekend. While Vegas has the horse as an overwhelming favourite heading into Maryland, many have openly wondered whether the testing conditions at Churchill Downs will have sapped the colt of his energy. The horse’s trainer Bob Baffert was supremely confident following the Derby win however, saying the horse is raring to go ahead of this weekend’s Grade 1 contest. “He went around there and he looks no different than he did before the Kentucky Derby,” Baffert said. “We’re pretty happy with where we are right now. He looks healthy. He didn’t lose an ounce of weight, which is very important. “The next day (after the Derby), he was so bright and so full of energy that I was pretty impressed myself. Usually all my Derby winners—it takes them about five days to fully snap out of it. But he was pretty sharp the whole time. ^New Customers only. Turnover requirements apply. T&Cs apply. Excl NSW, WA, SA & VIC. Gamble responsibly. Will Justify’s lack of two-year-old experience help or hinder? The biggest question coming into the Kentucky Derby was Justify’s lack of two-year-old racing experience. Baffert prepared his horse spectacularly to overcome the “curse of Apollo”, named after the the last Derby winner to win in the Churchill Downs feature without a start as a 2YO back in 1882. In just his fourth-ever race start Justify ran the field into the ground to record a powerful Derby win. Prior to the Derby however, Baffert mused that the thoroughbred landscape has changed and that a three-year-old that comes into the race without any experience the year prior will win a Derby sooner rather than later. “I think the game has changed; horses don’t run as often as 2-year-olds as they used to,” he said. Baffert broke the curse after 136 years of failure, but will that make a difference going into the final two legs of the Triple Crown? The fact that the horse has not been run into the ground over the course of its career to date will be beneficial, especially after a slogging Kentucky Derby where Justify had to overcome torrid conditions. Any conditioning factors in the colt’s favour will be monumental. The patient approach has paid off so far for Baffert, who said the horse simply was “immature” during his time as a two-year-old. The master-trainer said however he always had faith Justify would become a star. “We knew he was something special from day one,” Baffert said. Justify next runs in the Preakness Stakes on May 19 7.35 pm ET (May 20 8am AEST).